When I lived down in Winter Haven, Florida back in 2007 as the Indians Spring Training Marketing Coordinator, I had the chance to swing by Universal Studios with my girlfriend to enjoy some amusement park fun. We were standing in line for one of the rides, I believe the “Twister” ride–if you want to call it a ride, and there was a woman eating a giant chicken leg! 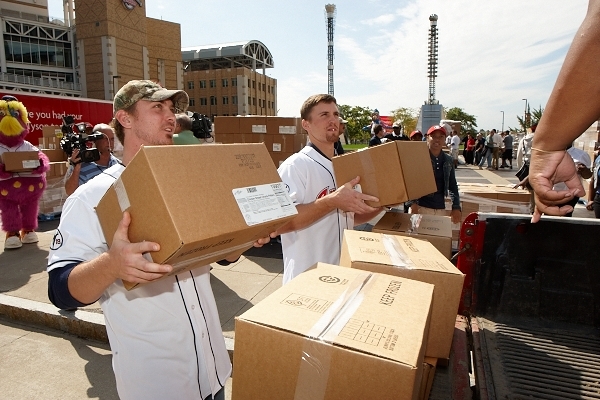 The Cleveland Indians recently partnered with Tyson Foods and Lift Up America for a food drive. Tyson Foods donated over 31,000 pounds of meat (mostly chicken) to help feed local food agencies. With help from The Cleveland Food Bank, 28 food agencies swung by Progressive Field and picked up their portion of meat. Prior to the pick up, a press conference was held on Gateway Plaza to announce the news. Volunteers from the Baldwin-Wallace football team, Cleveland Metro School District as well as Indians outfielder Trevor Crowe, Pitcher Josh Tomlin and 2nd baseman Cord Phelps were on hand to help load the trucks with food. 31,000 pounds…now THAT is a whole lot of chicken!